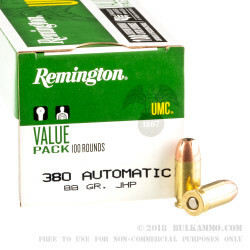 A great round to break in your guns with, this is a nice powered 88 grain JHP round that usually can functionally operate the mainstream .380’s on the market. These .380 Autos generally are pretty picky with the type of round they like and using lighter springs or changing the hardware is often not a good option as you’re always chasing reliability if you opt for that route. After break in, these rounds are a phenomenal choice for any .380 Auto in the initial phases of break in, most sub compact .380’s like the UMC line by Remington. It has the added bonus of being a copper jacketed hollow potion round which gives some performance increases for those who intend to carry their shiny new .380 Auto, and who wouldn’t? The performance, while not on the premium tier, is still substantial and offers a good mix of accuracy, dependability and functionality. 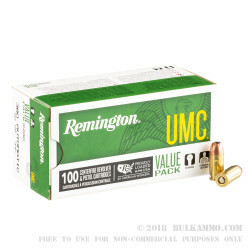 Since their merger in 1912, the Union Metallic Cartridge company and the Remington Arms manufacturing company have been producing top quality ammunition that has a reputation for high functionality and reliability. Good value for the money for practice and back up, but I keep Hornady as my carry load. The price is nice, and it's good quality for the money. 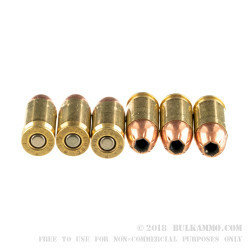 One of my local ranges does not allow FMJ's so these are a good quality JHP for practice, and back up. 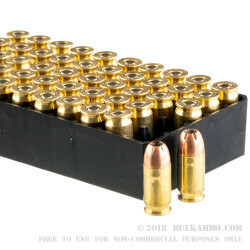 For my carry load, I use Hornady self-defense rounds.